Perhaps, like many of you, my love for animals and my desire to give something back for all the joy they bring to me, led to my becoming a volunteer at the Pat Brody Shelter for Cats. I recently traveled to Malta and Sicily to attend a conference where other caring people from all over the world gathered to discuss the health, environmental, and ethical benefits of a compassionate, plant-based diet. 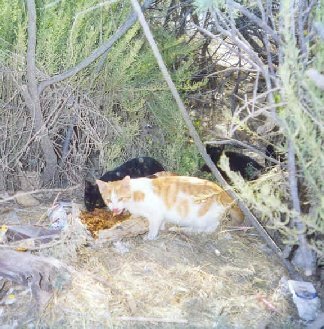 While in Malta, I spent some time with a feral cat colony. I was walking along a beach when a small black cat darted across my path and into some rough bushes that lined the street. I peered in and saw some empty food tins. I walked excitedly down the street to a small general store and bought some cans of wet and - what I thought was - dry cat food. After leaving the store, I realized that the 'dry food' was in fact cat litter. Feeling a bit embarrassed, I went back to exchange the litter for food. Never having grasped the exchange rate of Maltese money, I relied on the honesty of shopkeepers, taxi drivers, etc. So, I'm not sure what this cat food ended up costing me, but it was worth every Lira. Hurrying back to the beach, I crept up to the bushes and opened a can of food. That metallic 'ching' must be the international sound for din-din, because three heads popped up out of the bushes. These weren't just any cats, these were Maltese cats; and with regal majesty they watched me scoop the food out onto an old newspaper. I backed away and watched the three eat. I opened the other cans and placed some wet and dry food at each gap in the bushes, then headed off to get them some water. When I returned, there were at least a dozen cats feeding who seemed quite pleased with what I had brought them. I watched them finish and clean their precious faces. They all seemed quite healthy, and it was evident someone other than me was feeding them. Time with these angels was truly a highlight of my trip. I am one of several Vegans on the Pat Brody Shelter volunteer staff. A Vegan lives a lifestyle of compassion for all creatures, and consumes no animal products. It was a little tuxedo cat named Layla who helped me find this life of compassion. When I met her I was already aware of the health and environmental reasons to be a vegetarian. But more compelling was the idea that if this little flea-ridden stray could be so sweet and full of emotion, then how about a cow, a pig, a chicken, or a turkey? Once I made that connection, things fell into place for me: no longer would I consume or wear animal products. I believe this new century will be one of increasing compassion. It's already under way. Pepsi recently dropped support of bullfighting. Due to cruelty charges against Ringling Brother's Circus, long-time supporter Sears has dropped their sponsorship. Animal testing of products is decreasing as consumers demand cruelty-free alternatives. I welcome discussion, comments, and questions on these, and related subjects. I can be reached by email.